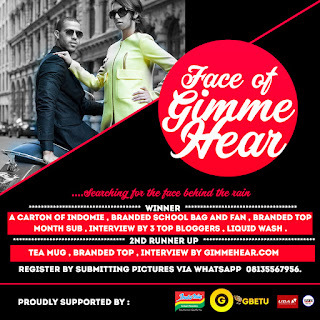 Home Entertainment Submit your photos for the Face of Gimmehear 2017! Submit your photos for the Face of Gimmehear 2017! Are you beautiful or Intelligent? Do you think you have both? Then you might be the royal face of gimme hear we have been looking for! Submission of photos have started! Pictures must be submitted before Monday, 5th of June, 2017. THE FACE OF GIMMEHEAR 2017!